Today officials are reporting President Trump plans to pull the United States out of the Paris Agreement on Climate Change. I’ve argued before that that would be an inexcusable foreign policy blunder. But wait, there’s more. Not only is the U.S. commitment to Paris in question, but so is its role in Mission Innovation (MI), an initiative of 22 countries and the European Union to invest in clean energy innovation. Although the Obama administration spearheaded the initiative and hosted its operations in the U.S. Department of Energy, the Trump administration’s budget last week would zero out funding to run MI. What’s more, the budget request aims to slash funding for energy innovation, rather than raise it, as the United States had pledged when it joined MI. Next week, energy ministers from around the world will meet in Beijing to discuss the future of MI. Even though U.S. support for the initiative has shifted, the underlying case for energy innovation hasn’t. In order for the world to achieve the climate goals in the Paris Agreement, it will need new and improved clean energy technologies. And that will require a redoubled commitment from countries around the world to support research, development, and demonstration (RD&D) of new technologies. MI still has an important role to play in encouraging that outcome. And its member countries have an opportunity in Beijing to show their support for innovation, refocus MI’s objectives and activities, and shore up the initiative’s resilience for the future. To help them accomplish all this, here are three new resources for them to consult. 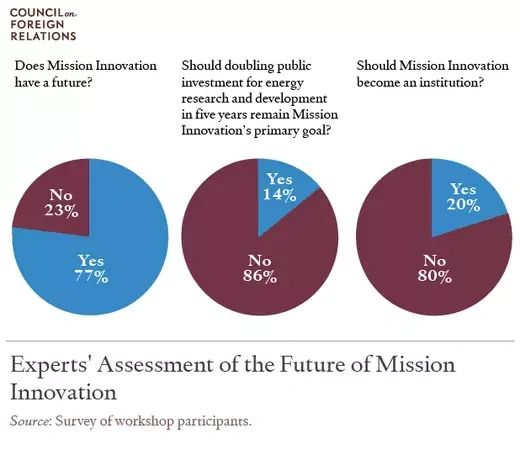 In particular, a lot of the discussion centered on the future of Mission Innovation. Participants suggested that the original objective of MI, which was to double global government RD&D spending by 2021, is now infeasible. That’s because the United States is by far the biggest funder of energy innovation in the world, but it is in danger of reducing, rather than expanding, RD&D spending. "There might, however, be a silver lining, some participants noted. Now that doubling global public R&D funding appears improbable, countries could focus on improving the quality of their innovation efforts. Many participants agreed that although the quantity of R&D funding is woefully inadequate today, simply doubling it could be wasteful. For example, one participant noted that India cannot double its public R&D funding because it lacks the institutional capacity to spend that money effectively. Many participants argued that a more promising function for MI could therefore be in enabling countries to share lessons about designing public institutions to fund innovation. The United States, for example, has the Advanced Research Projects Agency-Energy (ARPA-E)—modeled after the military’s funding body for emerging technologies—which funds potentially transformative technologies but cuts off grants to projects that miss their milestones. Though ARPA-E has existed for less than a decade, one participant noted that teams funded by ARPA-E are more likely to obtain patents and private funding than those funded by other arms of the DOE." Others cited Germany’s Fraunhofer Institutes and institutions in the United Kingdom as good candidates from which to distill lessons and share them across borders. Still, participants noted that institutions can’t simply be “helicoptered” from one country to another without differences in domestic political contexts. The figure below sums this all up. Participants were resolute in their support for the importance of MI continuing as a nimble, bottom-up initiative, though they recommended that it refocus away from a single quantitative goal of doubling R&D funding. 2. Sanchez and Sivaram, “Saving innovative climate and energy research: Four recommendations for Mission Innovation,” Energy Research and Social Science 29 (2017). "[MI’s member states should] work together to fill the gap in American leadership. Many countries are capable of hosting the physical secretariat itself, while sharing duties with other MI members. China is hosting the second annual summit and is committed to ramping up funding for domestic energy R&D. The United Kingdom is also a leader in promoting energy innovation. And the United Arab Emirates hosts IRENA and may be eager and capable of supporting a related initiative. Importantly, MI’s future operations should be designed such that it is resilient to another political change of heart in the country hosting its staff. Therefore, member states should share the financial cost of the staff and facilities of MI—which is a relatively small sum for a handful of staff members, given that MI is an initiative rather than an institution. This approach is the best way to keep all of MI’s member states engaged and to reinforce the inclusive and bottom-up ethos that defines the initiative. It also would mean that no single country could undermine MI’s future. Thus, this approach would enable MI member states and staff to focus on implementing its ambitious agenda, rather than worrying about its survival. Given all of these shifts and accommodations, member states in Beijing may be tempted to shun the United States, as it begins to retreat from its prior position of climate leadership. We caution against this approach. Even if the United States does not contribute to MI’s quantitative doubling goal, it is still the epicenter of global energy innovation, has valuable institutional knowledge to share, and might reassert leadership if its domestic politics shift in subsequent elections. Therefore, member states should take the long view and engage the US constructively in advancing the four activities described above. And for the United States to save face might require creative thinking: for example, member states might allow the United States to put forth a more politically tractable R&D doubling plan that focuses only on selected technologies, like nuclear power and carbon capture, utilization, and sequestration." My colleague Kelly Sims Gallagher at Tufts University and her collaborators have an excellent new report out with recommendations for the future of MI. The report aligns with the first two pieces in calling for MI to undertake more “diversified and realistic goals,” rather than focusing solely on a quantitative doubling goal for global public RD&D spending. Among the goals that the report recommends, two stand out to me. First, MI should aim to improve collection of data about clean energy innovation around the world. The table below runs through several of the metric that should be collected. And second, MI should take stock of its member countries’ funding priorities and aim to fill gaps in funding for underfunded technology priorities like nuclear power. 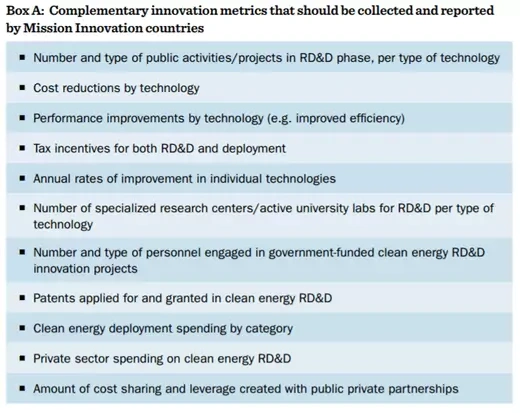 If member states take the recommendations in these three pieces to heart, Mission Innovation could seriously accelerate global clean energy innovation.